* Transient Analysis, Bias Point calculation, Transfer Function analysis, Pole-zero analysis, Noise analysis, Monte- Carlo analysis, Sensitivity Analysis, Distortion analysis, AC and DC Sweep Analysis etc. 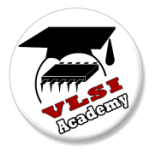 * Introduction to VHDL and its significance in current electronics development. * Behavioral modeling of digital components. * Data-flow modeling of digital components. * Structural modeling of digital components. * Sample models in VHDL. * Display of hot spots on the board. * Graphical representation of temperature distribution on a finished PCB at steady state. * Display of analysis results using isotherms and color mapping schemes. * Prediction of intensity of magnetic field generated by the circuit on the PCB. * Prediction of how a signal deviates from its ideal (or intended) behavior in a real-world setting. * Display of electromagnetic fields that are produced when power or signal traces on the board are energized. * Display of electromagnetic analysis results as color graph, isolines etc.